Racanelli’s Pizza & Brew | Eat It, Damn It! Pizza and Brew is a Westchester institution. They have multiple locations, and the family that owns the restaurant has a number of other eateries. I don’t eat Italian food (outside of pizza) very often. It is very rare that when presented with the “What do you want for dinner?” question that I will say Italian. When I do make that rare venture for Italian, I generally stick with common and traditional options: penne vodka, chicken parmesan, etc… Pizza and Brew is characterized by large portions and hearty dishes. They pile the food high and give you plenty of sauce with whatever your option. It’s not family style, per se, but they do have a “For A Bunch” option for most of their menu items. 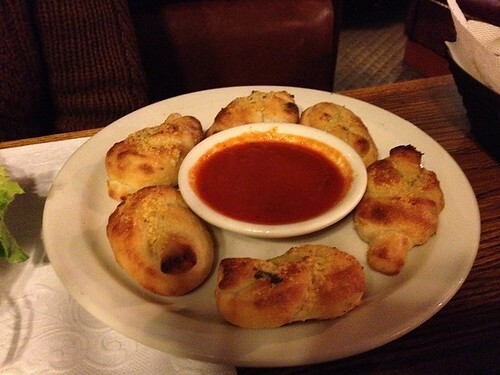 MG started with a small order of garlic knots. They were well buttered and heavy on the garlic. I would not be able to finish two of them without being doubled over in pain. Take that with a grain of salt as I do not use a lot of garlic. MG enjoyed them immensely. I got a small order of fried calamari. Just so that we’re clear, yes, what you see pictured is a small order. I imagine that the large is carried out by a team of waiters. 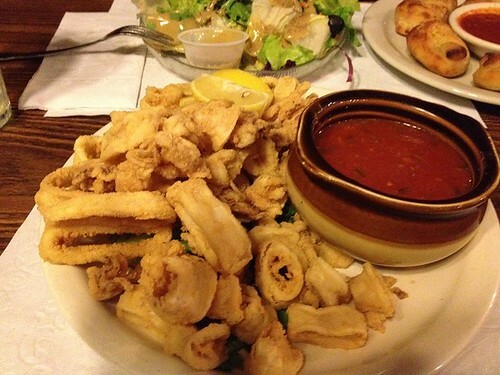 The calamari is OK. It was a little rubbery, but the accompanying sauce improved the flavor immensely. I was in the mood for the item, so I was satisfied. If I was not in the mood for them, I would probably be more harsh with my review. 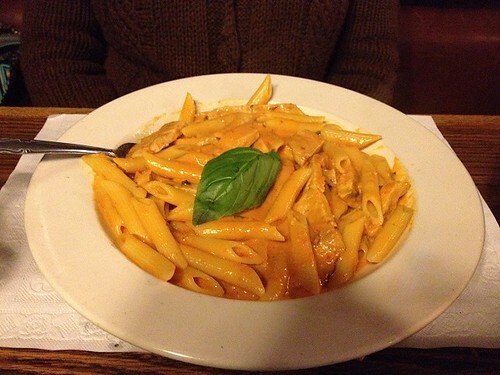 For an entree, MG got the penne ala vodka with grilled chicken. Again, the portion was huge. The sauce is creamy and rich, and a regular order is almost impossible to finish in a sitting. The grilled chicken was perfectly done and compliments the dish very nicely. I’ve had a number of grilled chicken items at Pizza and Brew over the years, and they always get it right, never overcooked or under-seasoned. Thumbs up. 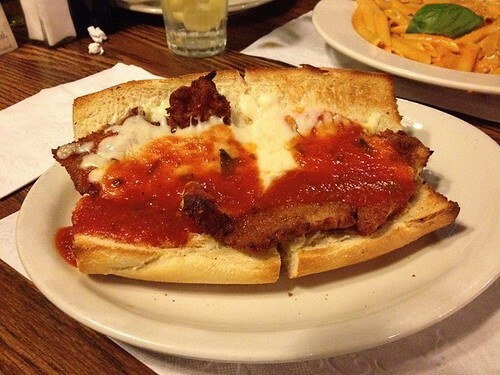 I wanted a simple comfort item, so I got a Chicken Parmesan sandwich. I am still searching for the chick parm of my dreams, but this was still a nice dish. Unlike the grilled chicken, the chicken cutlet is a little thin and therefore becomes a little overdone and stringy. It is not bad, but it is not ideal. The sauce is on the sweet side, but provides a nice bit of moisture for the chicken. The mozzarella is good and pleasantly, sparingly applied. The sandwich got me through, but will not be haunting my dreams. MG’s dish came with a choice of soup or salad. 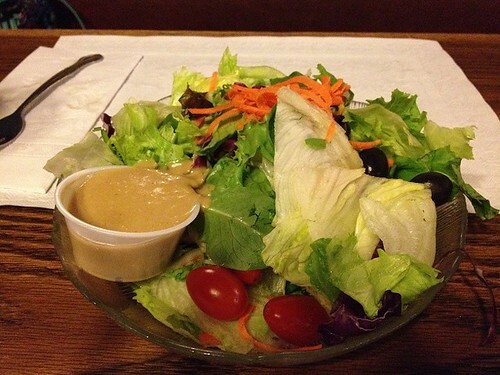 The salad is nice mix of leafy greens. She declared the house dressing, “OK”. If you are going to make a trip to Pizza and Brew, I highly recommend the Gnocchi Profumati. It is gnocchi in a cream/vodka sauce with grilled chicken. It might be the heaviest dish I’ve ever eaten, but it is decadent deliciousness. Definitely share it with someone.